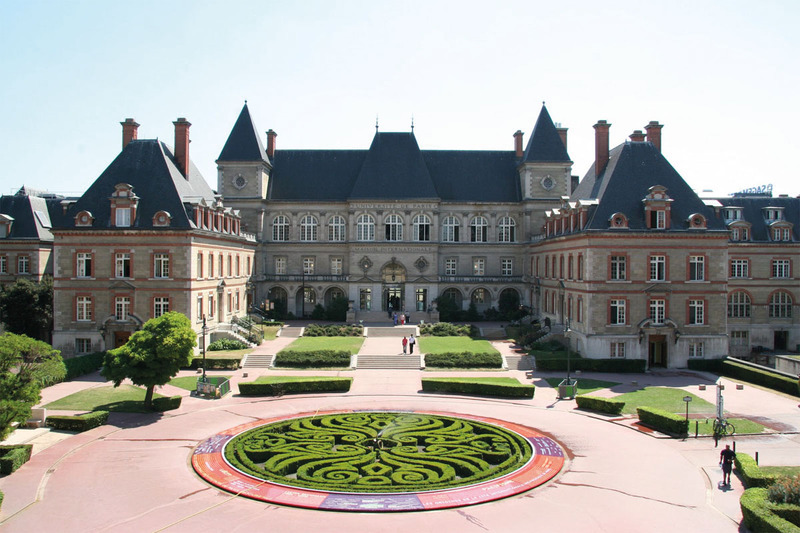 The work on the promotion of young musicians developed by Jesús Herrera (creator of Davidsbuendler) began with the organisation of these concerts during his residence at this institution at the Cité Internationale Universitaire de Paris. Throughout this period he volunteered to organise and coordinate a large sum of concerts at the Auditorium of the House of Mexico, which provided performance opportunities for many young, high talented musicians. In addition to the educational element for these young soloists, the aim to introduce classical music for free was added for students from all sorts of disciplines from the Cité Universitaire environment as well as to any other interested person. Diego Alonso (Spain), Anton Aslamas (Czech Republic), Jean Beers (England), Camille Benbaruk (France), Michalis Boliakis (Greece), Paul Cartianu (Romania), Bianca Chillemi (France), Daniel Díaz (Spain), Julien Gernay (France), Gwendal Giguelay (France), Silvia Gómez (Spain), Yves Guichaoua (France), Cordelia Höfer Teutsch (Austria), Ines Höpfl (Germany), Antonio Jiménez (Spain), Yedam Kim (Korea), Jennifer Kim (Australia), Paloma Kouider (France), Louis Lancien (France), Kateryna Levchenko (Russia), Rafael Lipstein (Germany), Janos Ludmany (Hungary), Nicolas Marceaux (France), Guillaume Matthias (France), Sélim Mazari (France), Irina Nesterova (Russia), Masahiko Omori (Japan), Milena Pavlovic (Serbia), Manon Philippe (Francia), Alexander Piper (Germany), Rita Saher (Morocco), Daniel Schneidt (Germany), Yuki Sunamura (Japan), Katharina Treutler (Germany), Justine Verdier (France). • Guitar Rafael Aguirre (Spain), May Cottel (France), Armen Doneyan (France), Álvaro Mendizábal (Peru), Daniel Romero (Peru). • Violin Alexey Aslamas (Czech Republic), Clémence de Forceville (France), Anna Göckel (France), Ahim Horvath-Kisromay (Hungary), Natalia Ladstätter (Switzerland). • Viola Adrien Boisseau (France), Léa Hénnino (France). • Violoncello Maja Bogdanovic (Serbia), David Eggert (Canada), Béatrice Gilon (France), Juliette Herlin (France), Hee Young Lim (Korea), Louis Rodde (France), María Victoria Pedrero (Spain). • Double bass S. Drappier (France). • Clarinet Pierre Génisson (France), Emilie Pinel (France). • Singers J. P. Bourrois (France). • Composition Agustín Castilla Ávila (Spain). • Jazz and popular music Alessandro Candini (piano jazz) (Italy), Doble Tango (Argentina), Duo Philippe - Beroy (horn and piano jazz) (France), El desmangue (tango) (Argentina). Foundation of the House Mexico. 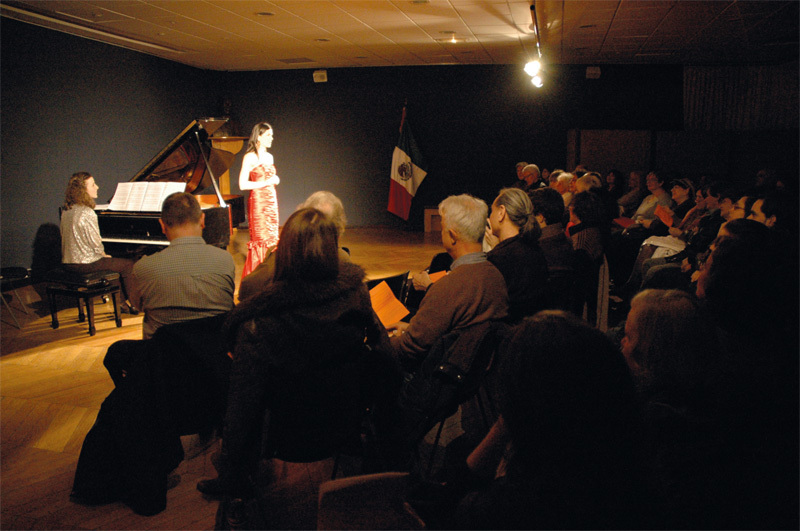 The creation of the Davidsbuendler Association favoured the collaboration with different institutions, thus allowing them to make the “Concert Series at the House of Mexico of the Cité Internationale Universitaire de Paris” evolve into a concert series in coordination with various institutions on this campus, thus continuing to offer free-access concerts for the professional training of high-level young soloists and ensembles. 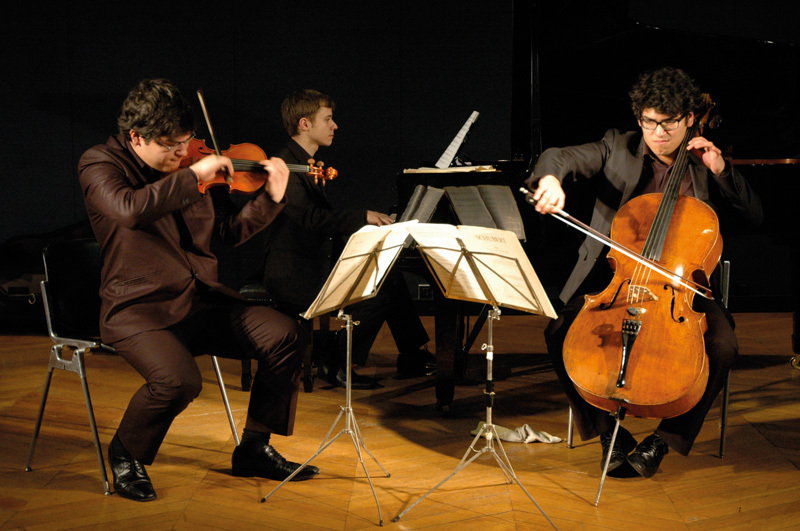 19 | 01 | 2012 Recital of the Suyana Trio at the Foundation of the House of Mexico. 26 | 01 | 2012 Recital of María Mirante (singer) and Bianca Chillemi (piano) at the Foundation of the House of Mexico. 5 | 02 | 2012 Recital of Sandra Urba (piano) and Philipp Boelk (trumpet) at the “Heinrich Heine” House. 19 | 02 | 2012 Piano recital by Patricia Hase at the “Heinrich Heine” House. 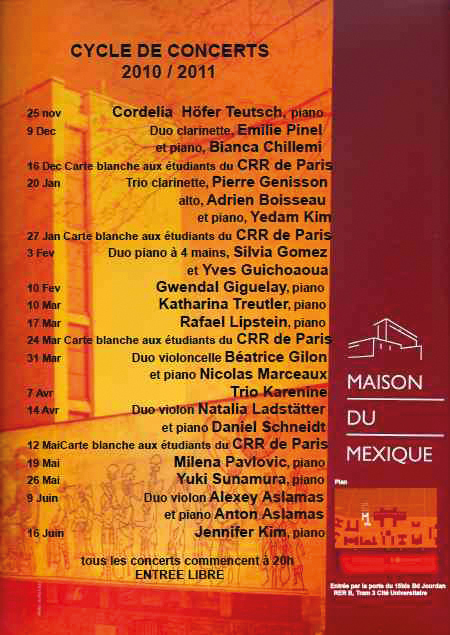 23 | 02 | 2012 Piano recital by Guillaume Vincent at the Foundation of the House of Mexico. 15 | 03 | 2012 Recital of the Norma Trio (Gwendal Giguelay, piano; Thibaud Maudry, violin; Elise Huteau, violoncello) at the Danish Foundation. 27 | 03 | 2012 First recital of the Davidsbuendler Project Artists (young Spanish pianists) at the Foundation of the House of Mexico. 29 | 03 | 2012 Piano recital by Andreas Loken Taklo at the House of Norway. 12 | 04 | 2012 Second recital of the Davidsbuendler Project Artists (young Spanish pianists) at the Foundation of the House of Mexico. 15 | 04 | 2012 Violin and Piano Recital with Hannah Walter and Markus Schweickert at the “Heinrich Heine” House. 18 | 05 | 2012 Recital of the guitar NoiZ Duo (Pedro Izquierdo and Dora Nakou) at the Collège d’Espagne. 24 | 05 | 2012 Recital of the Davidsbuendler Project Artists (young Spanish pianists) at the Danish Foundation. 5 | 06 | 2012 Violin and piano recital with Ahim Horvath Kisromay and Thibaud Epp at the Foundation of the House of Mexico. 7 | 06 | 2012 Piano recital by Artur Haftman at the Danish Foundation. 22 | 06 | 2012 Voice and guitar Recital with Luis Regidor at the Collège d’Espagne.